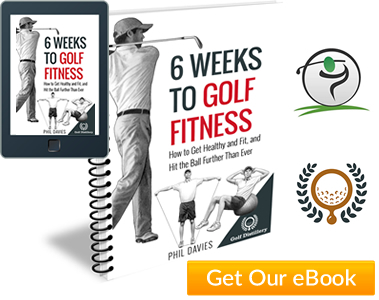 The logic goes that the more you think about, and try to control, the fine movements of your body, the more you get in the way of your unconscious mind and the harder it becomes to make a consistently solid contact on the golf ball. But clearing your mind of all swing thoughts and thinking of nothing is much easier said than done. 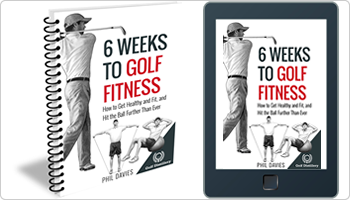 When you make changes to your golf swing it takes a great deal of conscious effort initially (like learning to drive for example). 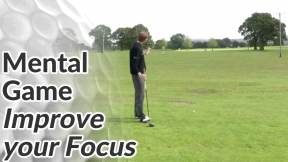 In a relatively short space of time those changes will become more automatic, however most golfers still think about some technical element of their swing during each shot. 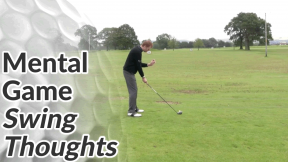 If, during your swing, your mind wanders to the various positions and sensations of your body or the position of club for example, it will impair your ability to hit a solid, accurate golf shot. Ideally, we want to keep our conscious minds out of the way – the trouble is, it’s very difficult not to think about anything as you stand over the ball. A good tip is to pick out a single letter on the golf ball’s logo and focus all your attention on that one letter during your entire swing. At first, you’ll notice your attention ‘jumps’ away from the letter to the position of your hands at the top of your swing for example. But don’t worry – just as physical skills take practice so do mental processes. On the practice range, dedicate a portion of every session to hitting balls focusing exclusively on a letter on the ball. This could be the last 10-20 balls of your session for example, where you forget about anything technical and work on holding your attention on that one letter right up until impact. 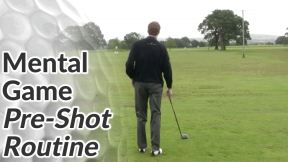 Make 2 practice swings before each shot. During the first you can consciously think about your technique (i.e. your weight shift, or your left arm for example). On the second practice swing think as little as possible about technical elements and just get a feel for your swing’s rhythm. Then go ahead and make a shot focusing exclusively on the letter.